For many people, flowering trees signify the welcome end to a long winter and the prospect of longer, brighter days ahead. Deciding which flowering trees are the most popular in North America largely depends on where you live. Traditional favorites are found among trees native to each region, although some imported species such as the crabapple have achieved equal popularity. The stately southern magnolia (Magnolia grandiflora) is perhaps the most well-recognized flowering tree of the American South. This large evergreen produces huge ivory-colored flowers that give off a fragrance that has been compared to the scent of jasmine. Although found along the eastern and western coasts of the United States, it grows most abundantly in the deep south. It is often associated with Mississippi, where it is the official state tree and flower. The eastern redbud (Cercis canadensisis) is another cold-hardy species that is an intense springtime bloomer. It’s hard not to stop and admire this tree when it is entirely covered with dark pink to red blossoms. The flowers even emerge on the trunk and older branches, which greatly adds to the intensity of color. The eastern redbud is recognized as the state tree of Oklahoma. 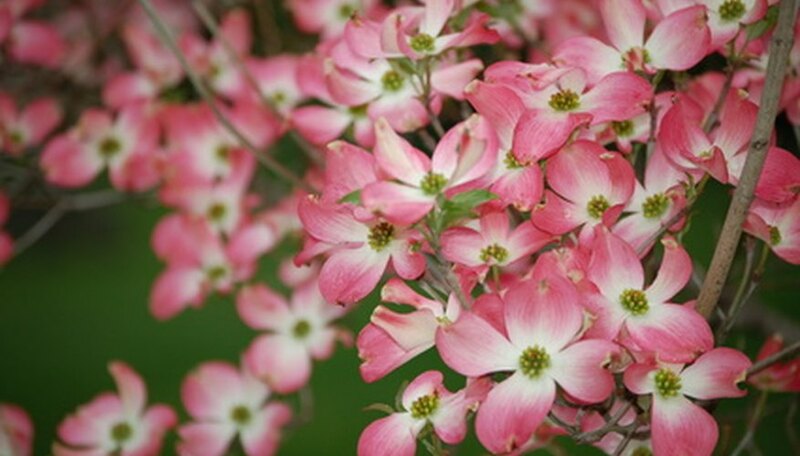 The flowering dogwood (Cornus florida) is a springtime favorite across much of the United States. Typically 25 feet in height when mature, dogwoods display profuse white to pink blooms from late spring well into summer. The popularity of these native trees is evident as they are the state tree and flower of Virginia and the state flower of North Carolina. The flower of the Pacific dogwood, cornus nutallii, serves as the floral emblem of British Columbia. Although thought to have originated in China, crabapple trees are a welcome sight in spring as they produce huge amounts of blossoms. Known botanically as the Malus species, they produce flowers of red, white or pink, with many varieties being very fragrant. These cold-hardy trees grow well down to USDA Plant Hardiness Zone 4 and are readily found in most of the continental United States and southern Canada. The crape myrtle (Lagerstroemia indicais) another import from Asia that has gained tremendous popularity as a landscape plant. Since its introduction to the American South in 1747, crape myrtle has been greatly admired for both its flowers and drought tolerance. The panicle-type flowers that hang down in 12- to 18-inch clusters are actually comprised of hundreds of individual blossoms in various shades of red, pink and purple. Of particular value to gardeners is the long summer flowering time which can brighten the landscape into the fall.